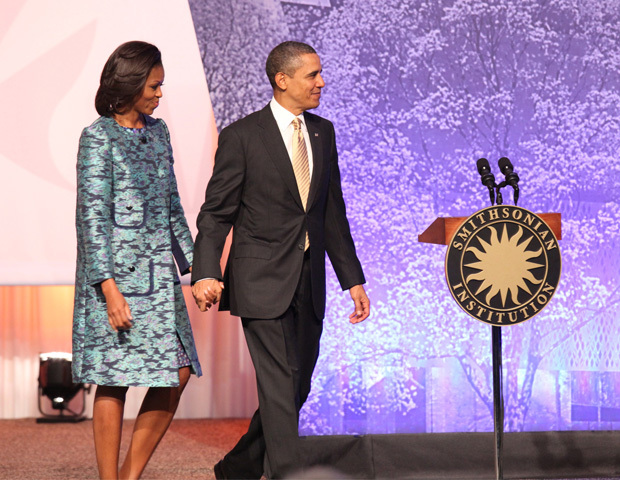 President Obama and Michelle Obama joined the proceedings to commemorate the largest such undertaking to reveal the contributions of African Americans to the world. Today, the White House released financial reports that showed President Barack Obama and First Lady Michelle Obama hold assets worth between nearly $2.6 million and nearly $8.3 million. The documents show the couple’s assets for 2011. The first family’s full assets were valued between $1.8 million and nearly $12 million in 2010. Assets include royalties from Obama’s books,Â Dreams From My Father, The Audacity of Hope and Of Thee I Sing, which totaled between $250,000 and $2.1 million, alone, reports indicate. The Obamas also have a 30-year mortgage on their Chicago home worth between $500,000 and $1 million, with an interest rate of more than 5%. Vice President Joe Biden listed assets of between nearly $230,000 to $860,000, many of which are from investment accounts and insurance policies. The vice president disclosed in his 2011 tax returns that he receivedÂ more than $20,000 in rental income on a guest house in Wilmington, Del. Obama released this annual report mid-campaign, as much focus has been placed on the fiscal value of Republican opponent, Mitt Romney. The former Massachusetts governor is worth up to $250 million, with much of his money coming from investments. Romney recently amended his 2010 financial disclosures during the primary, and also release his tax returns, which showed offshore holdings that weren’t in the original disclosure, according to reports, including a Swiss bank account.